This asana is one of the most widely recognized yoga poses, Downward-Facing Dog is an all-over, rejuvenating stretch. Downward-facing dog is an ancient posture depicted in Egyptian Art that is thousands of years old. It teaches us that how everything is connected; how our heels are linked to our shoulders, how fingers influence heart, how our elbow placement effects the spine. Come to your hands and knees with the wrists underneath the shoulders and the knees underneath the hips. Curl the toes under and push back raising the hips and straightening the legs. Spread the fingers and ground down from the forearms into the fingertips. Outwardly rotate the upper arms broadening the collarbones. Stay in this pose anywhere from 1 to 3 minutes. 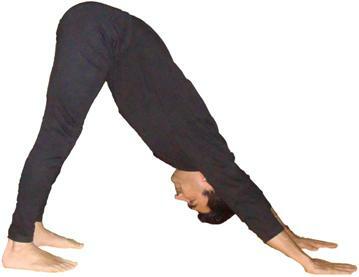 Then bend your knees to the floor with an exhalation and rest in Advasana. Calms the brain and helps relieve stress and mild depression. Stretches the shoulders, hamstrings, calves, arches, and hands. Strengthens the arms and legs. Helps relieve the symptoms of menopause. Relieves menstrual discomfort when done with head supported. Not for the persons who have carpal tunnel syndrome or diarrhea. Pregnancy: Do not do this pose late-term. High blood pressure or headache: Support your head on a bolster or block, ears level between the arms.